whom produce huge selling but otherwise over produced twee and souless recordings, with live shows to match. Most, if they contain anything akin to country or folk music, have it sanitized to such a degree that it can only really be called country pop. 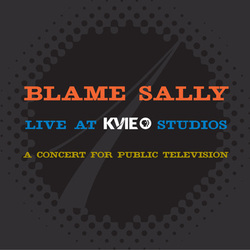 Blame Sally are the best all female four piece band that I have ever heard on record. I’ve only listened to their last studio recording, 2011s ‘Speeding ticket and a valentine’ and this tremendous live recording, but that is more than enough to know that they are quite special! Tweeness doesn’t exist in their makeup and they play and sing with as much soul and feeling as just about anyone else I can think of. They are highly skilled musicians when it comes to their instrumental licks and all four are tremendous songwriters and lead vocalists with their harmonies being just about unmatchable! They are all singer songwriters from the San Frncisco area, where each had her own solo career but started playing occasional gigs together, eventually deciding to take the band more seriously. else are those quite extraordinary harmonies. Usually I write at some length about individual songs but in the case of this album that seems unfair on the songs that don’t get a mention, so I’ll just mention a few in passing! (apart from Never going back!) They bring huge drama and power to songs that call for it, such as Her Name Is A Knife, Countdown andThrow Me A Bone and a sublime gentleness to others, in particular the gorgeous Orange whilst there is a mix of all of this on the seven minute spectacular, Hurricane, with it’s lovely atmospheric resonator guitar sound on a hard driving spectacle that includes the late addition of the accordion and with a tremendous bass drum beat all the way through. Generally I’m not a lover of live albums, with a few exceptions such as ‘Waiting for Columbus’ and ‘Rock of Ages’ and must admit to being amazed that I love this one so much when my expectations were pretty low. The fact is that this is a great album from four hugely talented women who in all probability wouldn’t know how to sound twee! The album will be released in the UK on 15thOctober 2012 and they are touring the UK and Ireland in October and November. They are playing on a Union Music Store presentation at The Lewes Constitutional Club on Saturday 27th October.